House prices in the capital are now 14.5 times the earnings of an average Londoner, according to Hometrack, hitting the highest level on record. This is up from last year's high of 14 times average income, despite house price growth having slumped in London over the last 12 months. This year's level is 42pc higher than the long-term average over the last 15 years. The measure gives a good indication of where the most acute affordability problems can be found. 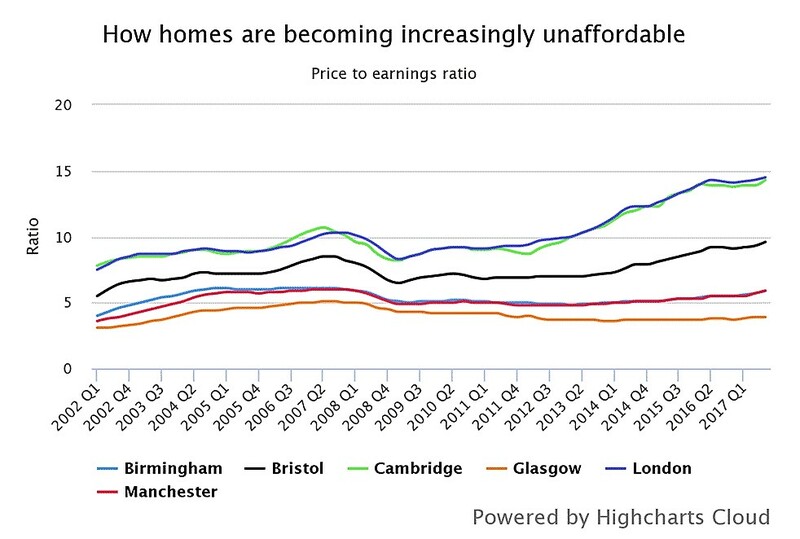 While house prices in the capital are around 60pc higher than 2007, this ratio has been boosted by mortgage rates falling over the period, increasing the buying power of households, as well as real wages across the UK declining. The average house price is now £496,000, while earnings are £34,200 a year. London was followed by Cambridge, where the average property is 14.3 times earnings, Oxford (12.6) and Bournemouth (10.1). In most cities outside the South East, this ratio has stayed largely unchanged in the last 15 years, and in Glasgow, Liverpool and Newcastle it is lower than the long-term average. It comes as house price growth in the UK's biggest cities rebounded, increasing 6.1pc in the year to October, up from 2.8pc in May, and the highest level since September 2016. Manchester and Birmingham recorded the highest rates of growth, at 7.9pc and 7.4pc respectively, both overtaking Edinburgh, which last month had the fastest-rising prices. Richard Donnell, head of research at Hometrack, said: “In regional cities outside of the South East, house price growth remains robust as affordability is still attractive and unemployment continues to fall. This can be seen in cities such as Manchester and Birmingham where the current house price-to-earnings ratio is only slightly higher than it has been on average over the last 15 years. Separate data from Barclays Mortgages found that the postcode where there has been the highest house price growth in the last year is Ladywood in Birmingham, at 17pc. This was followed by Holyrood in Edinburgh and Finnieston in Glasgow. House prices in London have increased by 3pc, driven mainly by the outskirts, while in central London average prices are flat or falling, and the gap between asking and achieved prices is 8-10pc. "House prices are in the process of adjusting to what buyers are willing or able to pay," Hometrack said. Barclays said that the highest rate of growth in the city was in Clapton, north east London, where prices rose 5pc.